My daughter, Lisa loves cheeseburgers!! She would go every night to Mickey D’s if I would let her. So when I made this recipe I knew it would be a hit! What I didn’t realize is that me and my husband would like it as much as the kids. The great thing about this, is that you can make it the night before and it’s ready to go! First, cook the shells according to instructions on the box but cook them al dente, about 8 to 10 minutes. Drain and rinse the pasta in a colander, and let cool. 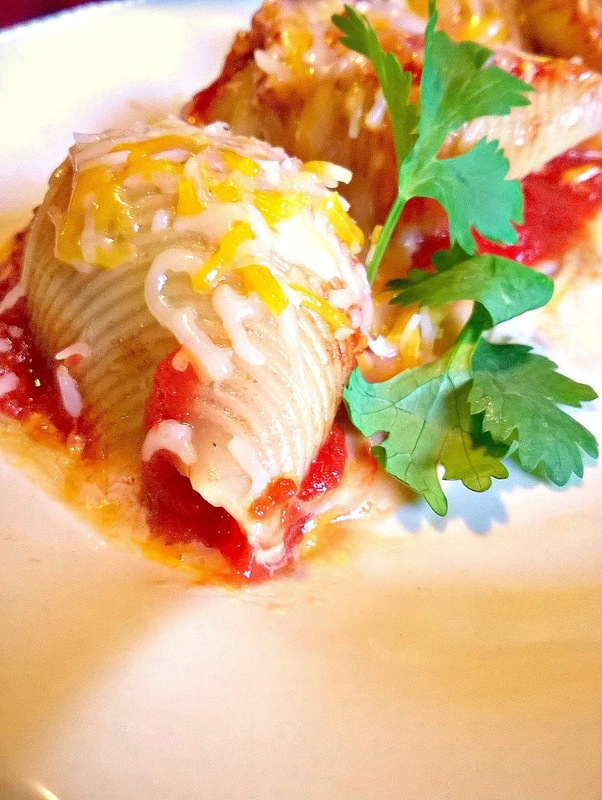 Filling: While the pasta shells cool, mix the filling together in a larger mixing bowl. Combine beef, 1/2 cup ketchup, mustard, onion, relish, Worcestershire sauce, pepper, and 1 cup shredded cheddar together with your clean hands. In a separate bowl, whisk the remaining 1 cup ketchup and tomato sauce together. Assemble the shells: Ladle enough tomato sauce to lightly cover the bottom of the 9×13 casserole dish. With your hands, fill each cooled pasta shell with a handful of filling (about 1/4 cup worth), and place shells filling side up in the baking dish. Continue until all the shells are filled. 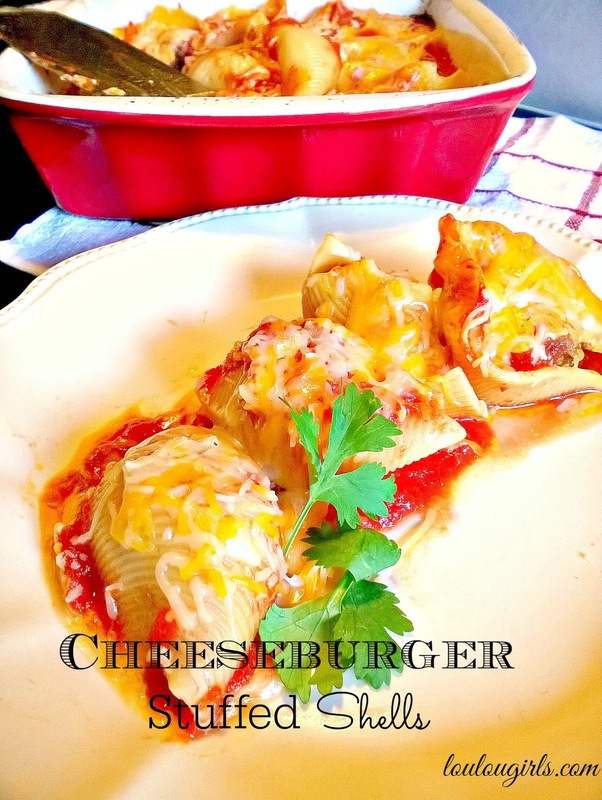 Drizzle the remaining sauce over the shells and sprinkle the remaining cheddar cheese evenly on top. Cover the dish tightly with foil. You can either cook it right away or it can be refrigerated over night. Preheat oven to 400 degrees. Bake, covered for 30 minutes, and then uncover and bake for 10 minutes more or until the cheese is bubbling. This look so yummy! Thanks for sharing! This sounds great. Thanks for linking up with us this week. Looks and sounds so yummy, thanks for sharing! I love having lots of new options for dinner….I get sick of the same old thing before anyone else does! This sounds like a great twist on a classic, and I can't wait to try it out! Oooh yum! Pinned. Thank you for sharing at Merry Monday! What a delicious, comforting, family friendly dish. Sharing! Thank you for being a part of the Hearth and Soul hop. 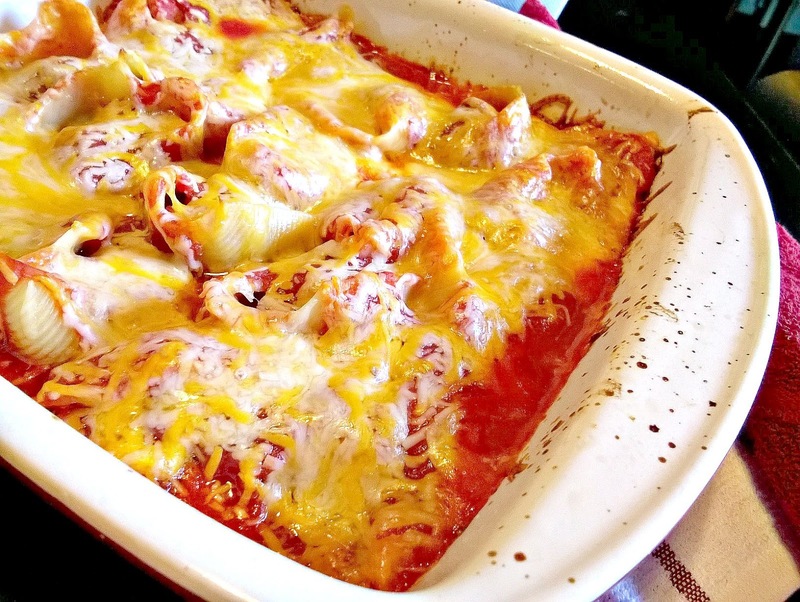 Delicious stuffed shells, love to try it thanks for sharing with Hearth and Soul blog hop, pinning. What a great weeknight dinner! Yum! Thanks for Sharing on My 2 Favorite Things on Thursday!! Pinned! Hope you come back tomorrow! !